It's eaten hot or cold. I ate it cold very often in Soviet-style cafeteria lines in post-Soviet Moscow. It was reliably vegetarian. I really like it cold. So, making a variation on the eggplant lasagna. Saw a recipe that assembled it like a regular lasagna, with long slices of eggplant for noodles. I ran out of eggplant, but had a few no bake lasagna noodles to complete the top layer. Dh will be happy about that, lol. I grilled the slices to save on cleanup and to minimize ove use. Added turkey sausage to my sauce. Otherwise, I used ricotta with some spinach and Italian blend cheese and spinach in it. Layered the usual way with eggplant, ricotta, shredded Italian blend, meat sauce. Repeat, top layer of eggplant/pasta noodles. It is in the oven now. I hope it is good! I have a craving so my expectations are high!! Both of us love this!! Thanks, McC for inspiring this! Wooo! Glad it came out! There's a dish my husband makes that I really like. It's based on an asparagus recipe in Madhur Jaffrey's World Vegetarian. He lightly fries thinly sliced (into coins) Japanese zucchini (long and skinny, can be white or purple or yellow) in oil, then dresses it with soy sauce (coconut aminos here), sesame oil, sugar, Shao Hsing wine, red wine vinegar, sesame oil, and garlic. Good hot or cold. Becca--glad you found a new dish! Invented a new eggplant dish tonight. Had a beautiful, huge eggplant, very even in size end to end. So, I sliced 1/4 inch or so rounds, and brushed very lightly with EVOO, and a light sprinkle of salt, and grilled them until tender, but still keeping their shape nicely. Dinner tonight is tacos. Ds had a regular taco the way he likes it, on a flour tortilla(2, actually). For myself, I used one eggplant round, topped it with taco meat, some black bean and corn salsa, cheese, and broiled it. Added another round on top when it came out and topped with guacamole, and threw some lettuce and diced tomatoes on there. Dh stole my second one, lol. Then we had a couple more. They were smallish, so one was not quite enough, but I am very full now! Still lots of eggplant. Tomorrow night we will do a similar thing, but make little pizzas, using the eggplant rounds as a base for some sauce or a tomato slice, and some cheese and toppings. 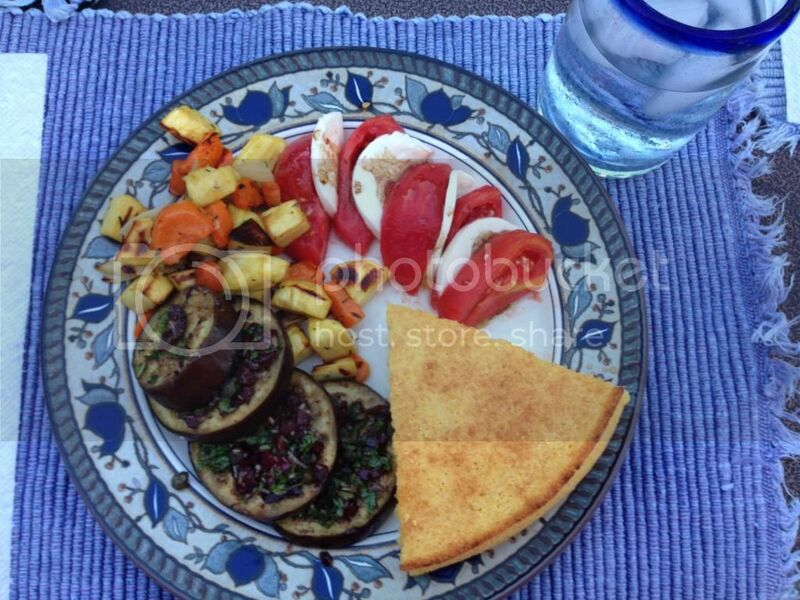 This is one of ours fave ways to eat eggplant. You roast eggplant rounds. While you're doing that, make a sauce if EVOO, balsamic, chopped parakeet, chopped kalamatas. Capers if you've got them. Whisk together. When you remove the eggplant from the oven, too with the green sauce. Wowza!! Eggplant with amazing green sauce (parsley, kalamatas, capers, olive oil, balsamic or red wine vinegar). This is very good and so easy becca. But I recommend substituting parsley for the parakeet. Lol. Then there is the parakeet 3 ways. Dh hates olives and similar briney things, but that looks yummy to me. There is a lot of labor on that plate! 3 salads and cornbread? Thinking of doing something with eggplant and chicken and curry tonight. I got an email from my local farm stand about the current crops they have from their own farms. Also lots of other things from area farms. I'm wanting to make baba ganoush tonight but can't find the tahini-free version I made a couple of years ago. I adore th Pioneer Woman's entry for baba ganoush. You'll need medium-large sized eggplants that when cut lengthwise will become a steady 'boat' for the lasagna stuffing. Wash outsides and dry, cut off stem, slice lengthwise. Scoop out the middle of the eggplant (melon baller works great) leaving 1/2-3/4" of eggplant. You'll want it scooped enough to be a good boat and get some nice filling in there, but also want a fair bit of eggplant. Make your favorite lasagna filling. Mine is 1 c. whole milk italian style ricotta (smooth, not grainy), 1/3 cup grated parmesan, 1 egg, 1 TB freshly chopped parsley, 1/2 cup fontina cheese. Put a little sauce on the bottom of your dish to protect that side of the eggplant while cooking. Use non-stick foil...just because you'll regret not doing so. Lay the eggplant boats in the dish and fill with lasagna filling. You can add spinach, meat, etc. if you like. Top w/ sauce. Cover with foil and bake 30m-1 hour. I know, I know. It depends on the type of eggplant, how thick, etc. I baked mine until the eggplant was really done (fork test). Undercooked eggplant makes my mouth itchy. Do be sure the filling reaches 165F. When the eggplant is cooked through and the filling is puffy, uncover and smother in shredded mozzarella/fontina. Or burratra...omg that would be awesome. Melt cheese and your done! That sounds yummy, Nameless! I might try a carniverous variation on that, but still with the ricotta filling, too. Maybe incorporate the leftover eggplant from scooping into with a sweet sausage filling. My neighbor gave me 6 Japanese eggplant yesterday. I’m having stir fried eggplant for breakfast, lol. I didn’t have jalapeño, so subbed in a little chili garlic paste, and I used Swerve sweetener, and arrowroot for the thickener, and a drizzle of toasted sesame oil. Oh, and added some basil I had sitting in the fridge. Otherwise, followed just about exactly. SO GOOD! I think it would be good cold as well, with an Asian inspired salad.